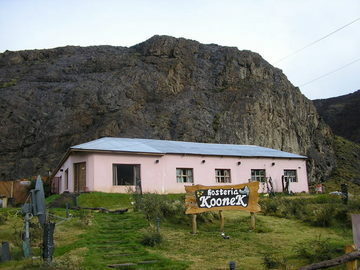 Hosteria Koonek is a pleasant four room B & B all with private bath. It’s painted pink and set on a small hill making it recognizable. In summer it’s many rose bushes on the front lawn must be quite nice against the shear rock wall behind the house. Everything is in excellent condition with attractive stone floors and wooden furniture. The rooms are spacious, even when, like mine, they had 2 single beds and a bunk bed. The bathroom had new fixtures including a bidet. 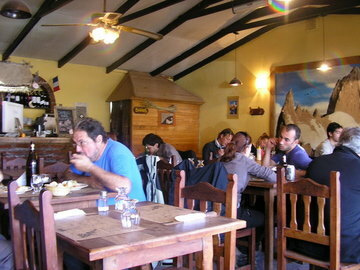 Breakfast was the classic Argentine continental with good strong coffee, toast, jam, cream cheese, butter and juice. Even though check-out time was 10:00 AM, my bus was not leaving until 11:15 PM. They had no problem with me leaving my bags for the day. 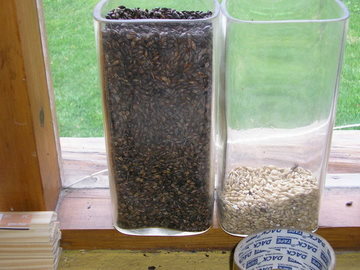 The rate for a single (off season) was AR$130 (US$36.00). A double would be slightly more. 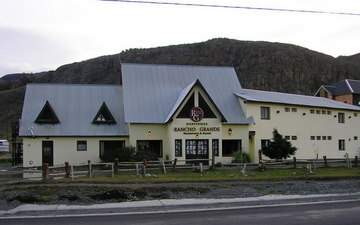 Rancho Grande Hostel and Restaurant is owned by Chalten Travel, one of the areas most active bus and tour companies. 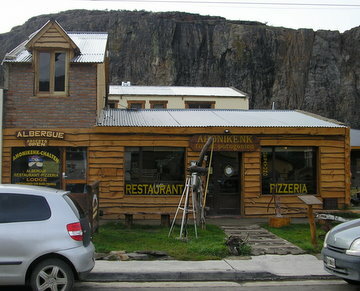 It is directly in front of Hosteria Koonek. 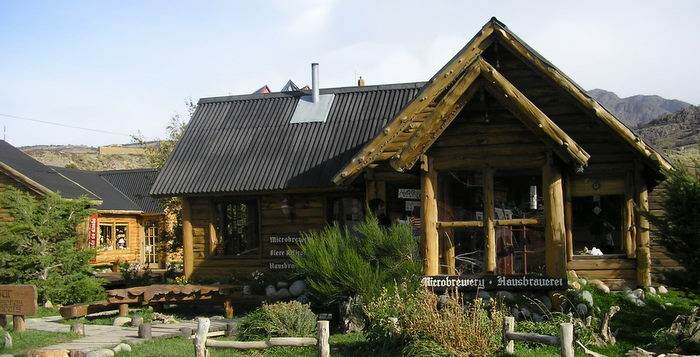 I spent most of my four evenings in El Chalten sitting in their common room writing and enjoying the camaraderie of the international mix of people that hostels bring together - they are also one of the locations with internet service. As well as the usual kitchen facilities, Hostel Rancho Grande offers what many hostels do not: a full service restaurant and bar open from 6:00 AM to midnight and nightly free first-run movies. Dorm beds: AR$45 (US$12.50) and private rooms with bath: AR$130 (US$36.00) - off season. Many hostels are family friendly. Two French families with four children ranging in age from 5 to 9, stayed for three days. I met them later on a particularly beautiful 10-mile trail up the mountain to observe Mont FitzRoy. A Brazilian family with two children aged 9 and 12 arrived the following day. An older couple, the wife in a wheelchair, were also guests as they have handicap accessible rooms. Cheltan Travel buses arrive directly in front of the hostel. 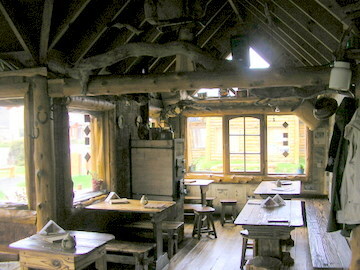 The restaurant is informal and not high cuisine, but everything I had was well prepared and professionally served. My first dinner was Spinach Stuffed Cannelloni with Roquefort Cream Sauce. The cannelloni were actually crepes, but the dish was definitely not out of a box heated in a microwave. 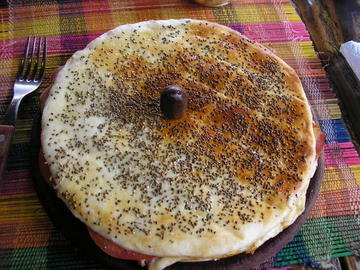 The crepes were thin, the spinach stuffing savory as well as the Roquefort cream sauce. 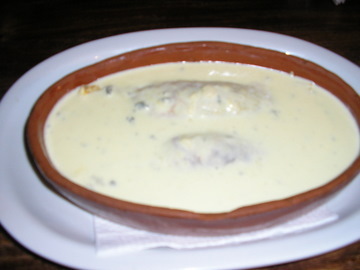 (Argentines love Roquefort Cream sauce, and I’ve had it on steak, open faced broiled ham and tomato sandwich as well as on fish fillet - although it does mask the flavor of white fish). With a mixed salad the bill came to AR$37 (US$10.25). My second dinner was true comfort food, the Rancho Grande Burger - a large, hand made grilled beef burger with ham, cheese, lettuce and tomato with French fries topped by two perfectly made sunny-side eggs. Every component was expertly cooked. The beef was lean, the fries moist inside and not at all greasy, and the runny yolk added to their flavor. Satisfying and fresh is good comfort food: AR$28 (US$7.75). They do have a small selection of wines in the AR$35 - $100 range (US$9.60 - $27.50) and Argentina’s most popular beer, Quilmes for AR$15 (US$4.15) per quart, 12 oz bottles half that price. Their coffee is excellent espresso. A double espresso is AR$5 (US$1.40) - can Starbucks do that? As for nightlife, during the summer - December through March - a number of clubs with late night music are open, but these close-up tight off-season. 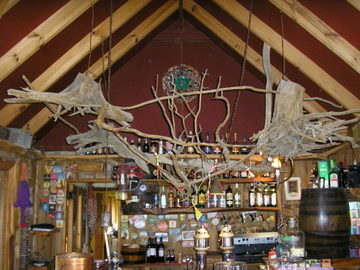 The pine colored wood of the linga and beech, sometimes varnished a honey hue or stained dark brown, is pleasantly ubiquitous in Patagonia, and the interior of Ahonikenk Restaurant and Catering is no different. 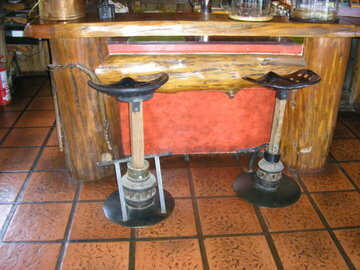 On the outside they have some old tools and folk art that help distinguish it from other establishments. I had not heard of the restaurant, but it was open when one that had been recommended was closed for the season - something the guide books usually fail to mention. I was not disappointed, except once, with the three meals I had at Ahonikenk Restaurant and Catering - which also has a small hostel upstairs. 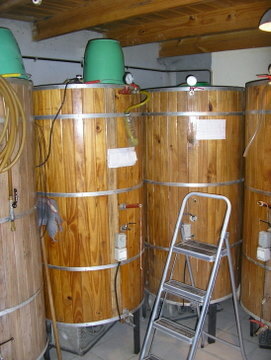 It is efficiently run by a half dozen young people. 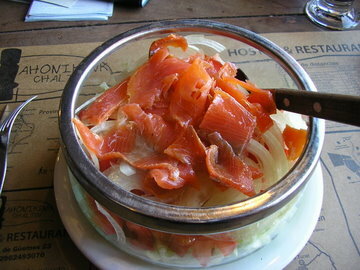 For my first meal I had a mixed salad (tomatoes, lettuce and white onions) with abundant slivers of moist red smoked trout. The trout gave the salad depth, and I put a few pieces on bread just to enjoy its flavor alone. 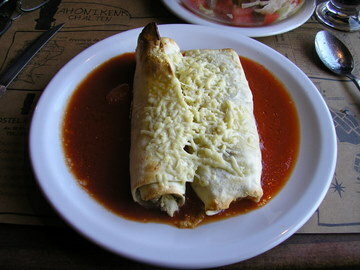 The main course was Ricotta stuffed Cannelloni with toasted nuts with a simple tomato sauce. The pasta was aldente, the toasted nuts were a nice texture contrast to the ricotta, soft but dry, and the sauce kept simple. It was a satisfying lunch. AR$40 (US$11.00). 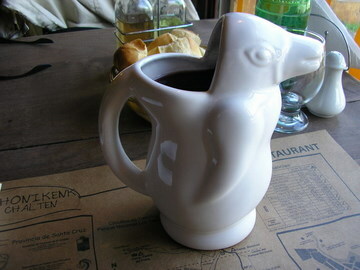 They have a small wine list with a house wine, served in a bird shaped jug, for AR$14 (US$3.85) for ½ liter (17 oz). I was a perfectly decent red. 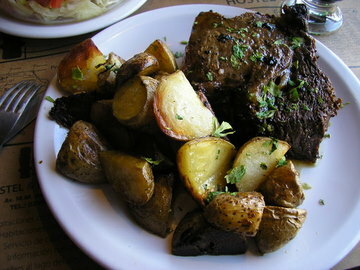 My second lunch was the menu of the day (set special): Braised beef (lomo) with roast potatoes and beverage (bottle of mineral water, coffee or tea) for AR$27 (US$7.40). The beef was a succulent slab at least 12 oz with the rich pan juices and at least 8 oz of perfectly roasted potato wedges - hot and moist on the inside, crisp on the outside. I added a mixed salad for an additional AR$9 (US$2.50). 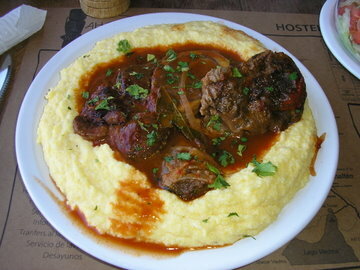 For my third meal, I ordered Polenta with Ossobuco, which is a favorite of mine, and I had not had it in Argentina. A large plate of polenta with the osobuco in the middle and a savory sauce was set in front of me. The polenta was creamy, and its texture proved it was homemade. The sauce had definitely been part of the braising of the osobuco. But the osobuco (ox tail) was very disappointing. It took all the energy of my mouth and teeth to chew through about half the meat before I gave up. It may have been the particular ox, but I’m more inclined to believe they cooked the ossobuco too fast at too high a heat. Ox tail, by implication, is not a tender cut, but it’s full of flavor. It requires slow braising at a low temperature for hours to break down the muscle tissue. With a mixed salad, the tab came to AR$37 (US$10.25). One disappointing item out of three meals is not too bad. With the pleasant atmosphere, and the low price, Ahonikenk Restaurant and Catering is a worthy establishment. From the outside, La Cerveceria Brew Pub and Restaurant is rustic cute mountain cabin construction, with a nice little garden in front - see top picture. With the name La Cerveceria Brew Pub and Restaurant in a town that attracts many 20-something backpackers, I made an initial assumption it was a hang-out for well-healed frat types. Well, enough with stereotypes. Inside the restaurant cute turns into artistic with the entire interior in honey hued wood, a service bar with two folk art stools, one-of-a-kind light fixtures constructed from drift wood, a very small brewery in the back room and Edith Piaf music playing in the background. 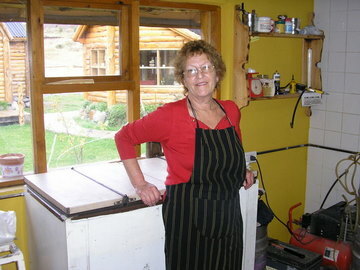 Three 50’s - 60’s-something women own and operate the La Cerveceria both brewing the beer and cooking along with a young, muscular chef, who would look comfortable in a lumber camp. I overheard that their Locro was terrific. I returned two days later during a cold, stormy afternoon - 50/mph wind-driven rain (I can only imagine the snowstorm on top of Monte FitzRoy) for a warm bowl. 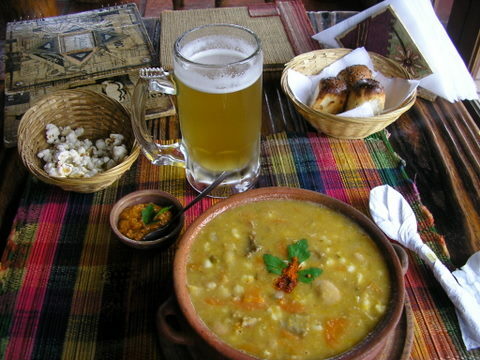 Locro is a stew much older than Argentina having been created by the pre-Inca cultures in the central Andes. It’s a thick and satisfying mix of ham stock, chunks of ham, fresh corn, potatoes, squash and large fava beans. Of course the indigenous cultures would have used other meats, pork not arriving until the Europeans. I can assume using goat or llama would be very good. Locro can be boring or wonderful depending on the time and effort put into the seasoning of the stock. La Cerveceria put in the time and effort. Served with homemade seeded rolls and a peppery vegetable spread, it was the best Locro I had in 6-months of Argentine travel! AR$36 = US$9.50. Sitting across from me was a young Japanese man also taking photos and notes. He writes for Japan’s leading guide book and is on a month long assignment in Patagonia. He was as taken with La Cerveceria Brew Pub and Restaurant as I was and also had the Locro and a mug of lager. Seems they’ll get two great recommendations on both sides of the globe.